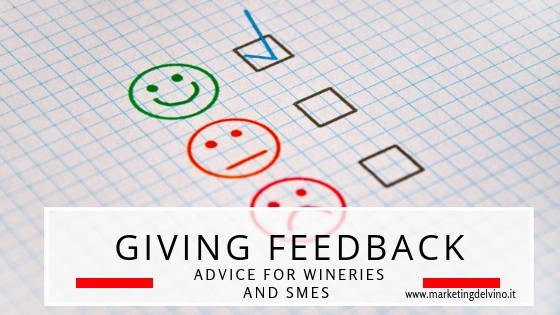 In the wine and food industry we often focus on how to receive feedback, on how to handle comments, and especially on how to react to a review, be it on TripAdvisor, Google, Facebook or any other platform. However, it is not often the case that the act of giving feedback is discussed. Of course, we all know that positive criticism is the best option, but what does it really mean? How should we tell a collaborator, a colleague, an agency or consultant that there’s something that’s not working in the project, in the way they are working, without them taking it personally? Besides, we must also consider an aspect that is typical of small and medium sized enterprises, especially in the wine industry. While in large corporations there is often the opportunity to attend specific training on the subject, this is certainly not a priority in SMEs. Not to mention that we’re often referring to family-run businesses: exchanging a professional, constructive feedback between parents and children, siblings and other relatives is extremely difficult. All those working in a family venture will know this too well. It’s also difficult when we’ve known our collaborators or peers for a lifetime, and they are basically a part of the family. And the fact there is no feedback cutlure, means that even relationships with consultants and agencies, for instances those who are designing our website or our labels, can become tricky. Positive criticism is based on three main ingredients, three pillars. First, specificity. Feedback must be specific. If you say “I don’t like it” or “I’m not sure it works,” this will be of no help to both the person receiving your feedback, and to yourself. Don’t be generic: say what it is that you don’t find convincing, and explain why. This excercise will be useful first of all to you, so that you have a better understanding of what you want, and it will allow your collaborators to have a quick response that will meet your needs without going on a treasure hunt. Feedback must be timely. We’re a bit like puppies: if the family puppy destroys the sofa, and you shout at him three months later, he’ll never understand. If instead you catch him while he’s committing the crime, with rubber all over the place, a look will suffice. This of course with the puppy: with people, you should still explain yourself. Finally, be proactive: give examples of works you’ve liked (in fact, you should do so even in the initial phase, when you’re assigning the project), give suggestions as to what you would like and be ready to reason your choice. Once we’ve seen the crucial elements of a constructive feedback or criticism, here’s a useful rule to follow. I’ve been using it for years, and it’s become almost instinctive. And it works. It’s the 3 K rule, which stands for Kiss, Kick, Kiss. Kiss – start by saying something positive. Even before you get at the criticism, thank for the work done so far, and highlight any positive aspect. What are the elements that are already fine? What are the skills your collaborator has, that you appreciate in this context? Start from those! This way, the person listening to you will feel appreciated, and will be more recepctive. If instead you start by criticising, they will stop listening, they’ll become defensive. They might even think you don’t understand them, or their work. Kick – Now is the time to communicate your constructive criticism. As we’ve already seen, this must be specific, timely, and proactive. These elements will make the meeting, or message, productive. Kiss – Finally, end on a positive note. Whether you’re writing an email, or you’re leading a meeting, make sure there’s a positive conclusion. Make yourself available in case the other person has any doubts or questions. Suggest a date by which you’d like to see the issues fixed. Make sure, in other words, that the people working with you know you want to see a positive conclusion to the project and that you’re sure they’ll be able to deliver it. Thanks to these tricks, if one may call them so, you’ll offer some constructive criticism, and develop a better team spirit, reaching your goals faster.